Vor kurzem berichteten wir an dieser Stelle über den Taifun Haiyan (siehe unseren Blogartikel „Klimaaktivisten missbrauchen Taifun Haiyan für eigene Zwecke: Studien fanden für die vergangenen Jahrzehnte keine Zunahme der Taifunaktivität“). Heute wollen wir uns die historische Entwicklung der tropischen Wirbelstürme in der weiteren Umgebung von Haiyan näher anschauen und begeben uns auf einen Streifzug durch die Welt der aktuellen Forschungsliteratur. The decade from 1990 to 1999 was by far the most active with 11 intense cyclones while 5 intense cyclones formed in each of the other two decades. There has been no trend towards an increase in the number of categories 3–5 cyclones over the last 30 years. During the period 1958–2001, the frequency of tropical cyclone (TC) genesis over the South China Sea (SCS) experienced an obvious interdecadal change around the mid-1970s. Compared to the period from late 1950s to early 1970s, the number of TCs is significantly reduced during mid-1970s through late 1990s. This interdecadal change in the TC frequency appears to relate to the increase in sea surface temperature (SST) of the tropical Indian Ocean. The difference of the circulation between the warm phase and the cold phase of the tropical Indian Ocean SST provides support for the influence of the tropical Indian Ocean warming on the variability of the TC frequency over the SCS. In the warm phase, lower-level convergent and ascending flows over the tropical Indian Ocean are accompanied by upper-level divergent flows, part of which go toward the SCS, leading to upper-level convergence and descent there. Consequently, two lower-level anticyclones develop and the TC genesis is suppressed over the SCS. 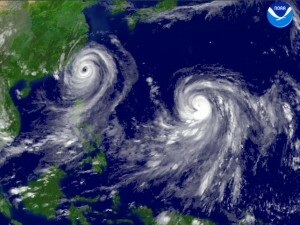 On a decadal timescale, the twenty-year interval from AD 1660 to 1680 is the most active period on record, with twenty-eight to thirty-seven typhoon landfalls per decade. The variability in typhoon landfalls in Guangdong mimics that observed in other paleoclimatic proxies (e.g., tree rings, ice cores) from China and the northern hemisphere. Remarkably, the two periods of most frequent typhoon strikes in Guangdong (AD 1660–1680, 1850–1880) coincide with two of the coldest and driest periods in northern and central China during the Little Ice Age. Conceivably, the predominant storm tracks shifted to the south during these cold periods, resulting in fewer landfalls in Japan and the east-central Chinese coast but more typhoons hitting Guangdong. Spectral analysis of the Guangdong time series reveals an approximately fifty-year cycle in typhoon landfall frequency. While the physical mechanism remains to be identified, it is tempting to relate this periodicity to the pentadecadal variability identified in the North Pacific Index (NPI) time series. Despite the long-term warming trend in [sea surface temperature] in the [western North Pacific], no long-term trend is observed in either the frequency or intensities of [TCs making landfall at the Guangdong province]. Ende 2012 veröffentlichten Kin Sik Liu und Johnny Chan von der City University of Hong Kong im Fachmagazin Journal of Climate eine Untersuchung zur tropischen Zyklon-Tätigkeit im westlichen Nordpazifik. Die Autoren fanden für die vergangenen 50 Jahre eine starke Schwankung der Aktivität im Jahrzehnt-Maßstab. Bemerkenswerterweise war für die letzten 15 Jahre seit 1998 ein starker Rückgang der Wirbelstürme im Untersuchungsgebiet zu verzeichnen. Offenbar spielen vertikale Scherwinde hier eine Rolle, die sich in der Region zyklisch verändern. Longer records show tropical cyclone activity was higher from 5000 to 3800 and 2900 to 500 yrs BP. Comparison to records from the North Pacific (out-of-phase) and North Atlantic (in phase) suggests a coordinated pattern of storm activity across tropical cyclone basins over the mid-late Holocene. Trends in tropical cyclone activity in the Australian region (south of the equator; 90–160°E) show that the total number of cyclones appears to have decreased to the mid 1980s, and remained nearly stable since. The number of severe tropical cyclones (minimum central pressure less than 970 hPa) shows no clear trend over the past 40 years. Abbildung 1: Anzahl der tropischen Wirbelstürme in der australischen Region für die Zeit 1970-2011. Quelle: Australia Bureau of Meteorology. Age distribution and relative probability frequency analysis of the dated coral and reef blocks suggest that there have been eight broad periods of storm occurrence since 1900 AD (1904–1909, 1914–1916, 1935–1941, 1945–1960, 1965–1967, 1976–1977, 1983–1988 and 2001–2007), roughly showing decadal variations. The coral-based storm reconstruction therefore extended the database of past storm occurrences around Heron Reef area. These findings suggest that coral reefs in the southern Great Barrier Reef are frequently influenced by periods of high storm activity, and show strong resilience to natural disturbances over the past century. JoNova brachte Mitte 2012 auf Basis einer Literaturauswertung des Science & Policy Institutes eine Übersicht zur historischen Sturmentwicklung in Australien und Neuseeland. Fazit: Es ist keine Steigerung der tropischen Wirbelsturmgefahr zu verzeichnen. Eine weitere Übersicht des Science & Public Policy Institiute zur Literaturlage der pazifischen Hurrikane erschien im Juni 2013. Auch hier konnten keine Hinweise auf eine drohende Verschärfung der Stürme gefunden werden.